Now that you’ve made an earth-friendly choice, you just have to choose from Blue Orange’s fun game titles; Crazy Cheese is a puzzle and brain-teaser in one slice of cheese – which is actually made up of nine wooden puzzle pieces with various size and width holes. The aim is to arrange the puzzle pieces in a square with all the holes being either completely circular, or symmetrical. It’s tricker than it sounds, and there are two levels (amateur and genius) to test out your skills. 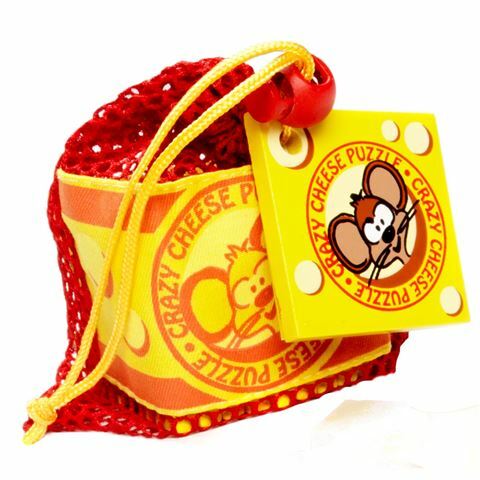 Includes 9 wooden puzzle pieces that are arranged in a 3 x 3 square, with the aim of joining all the holes in the cheese so that they are either perfectly circular or symmetrical. Presented in a mesh bag. Individual Puzzle Piece Dimensions: 5.5cm x 5.5cm.